His remarks came a week after White House staff secretary Rob Porter resigned amid allegations that he abused his two ex-wives. Trump faced widespread criticism for praising Porter and saying nothing about the women during his remarks on the matter last week. 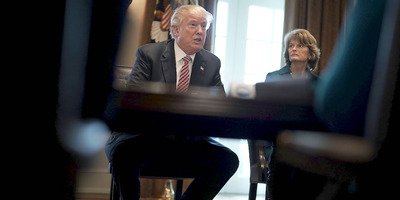 President Donald Trump on Wednesday said he is “totally opposed” to domestic violence after facing widespread criticism for praising his former top aide, Rob Porter, following Porter’s resignation last week amid accusations of domestic abuse. In his remarks last week, Trump did not mention Porter’s two ex-wives who made the accusations, nor did he assure the public that he does not tolerate abusers. Instead, he expressed sympathy with Porter, who he said was going through a “tough time.” He added that he hoped Porter would go on to have a “wonderful career,” and pointed to Porter’s denials of the allegations. “He said very strongly yesterday that he’s innocent, so you’ll have to talk to him about that,” Trump told reporters last week. Colbie Holderness, who was married to Porter from 2003 to 2008, has provided photos to news outlets of a black eye she says he gave her, while Jennifer Willoughby, Porter’s wife from 2009 to 2013, provided a copy of a 2010 protective order she filed against him. Both allege Porter abused them both physically and verbally for years. It has since become clear that the White House has been aware of the abuse allegations, which prevented Porter from receiving a government security clearance, for many months. The FBI says it told the White House about the allegations against Porter last summer, provided further information in November, and submitted the final results of its investigation in January. But White House officials, including counsel Don McGahn and chief of staff John Kelly, appear to have taken little to no action.